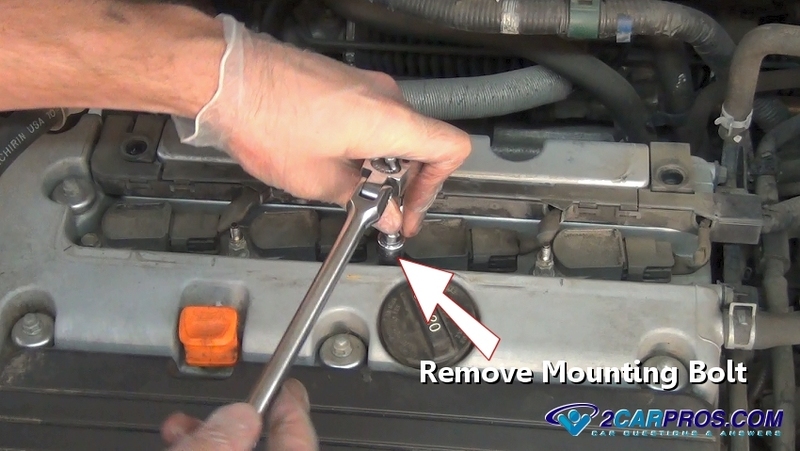 Begin with the vehicle on level ground, engine off (cold) with the emergency brake set. Step 1 - Some engine's are designed with a plastic cover over the ignition coils and spark plugs. 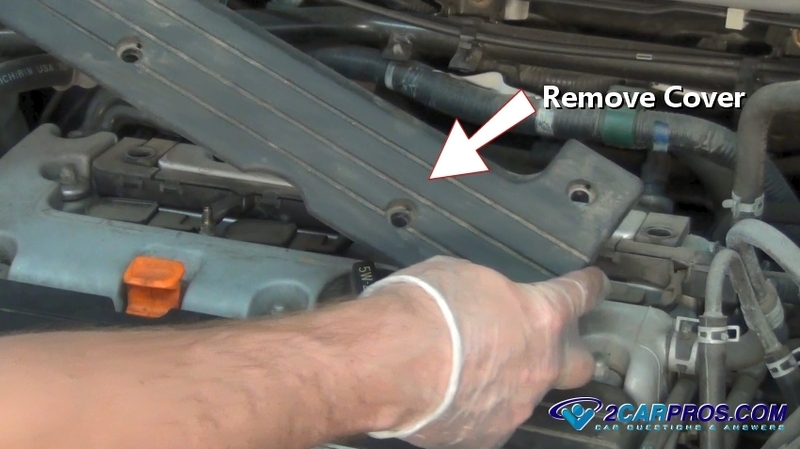 Step 2 - Use a socket or wrench to remove the nuts holding down the cover. Step 3 - After all mounting nuts have been removed, gently remove the cover. 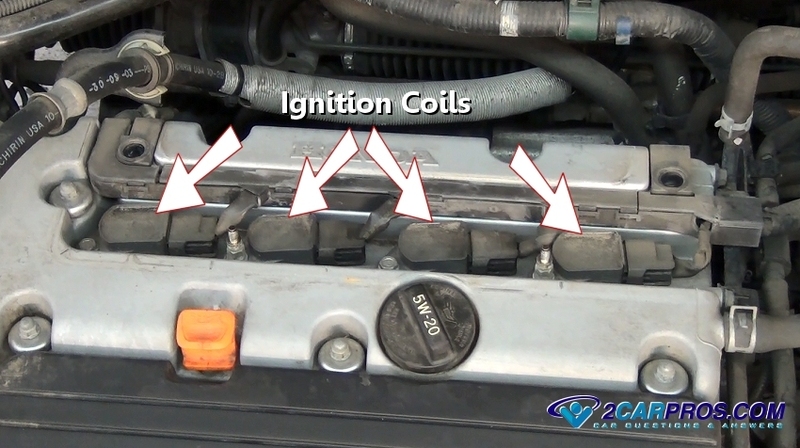 Step 4 - On COP (coil over plug) ignition system designs the spark plugs are located beneath the ignition coils. 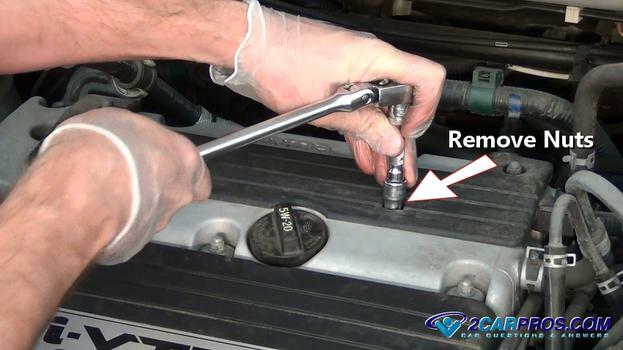 Step 7 - After the coils have been removed, use a spark plug socket to remove the spark plugs, this socket is specially designed to hold and protect the spark plug from damage. Step 8 - Use a ratchet and extension to remove the spark plugs, ensure the socket is completely on the spark plug before removal to avoid damage. 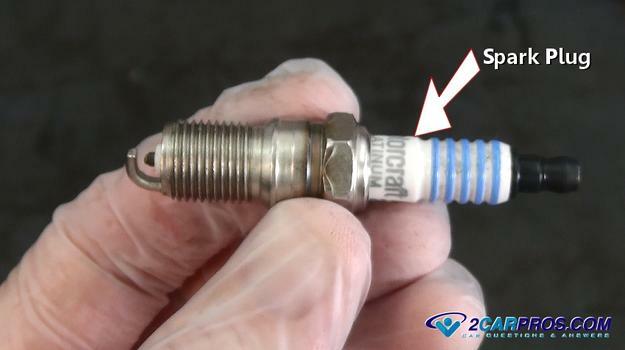 Step 9 - Once the spark plug has been removed, inspect the plug for damage and wear. 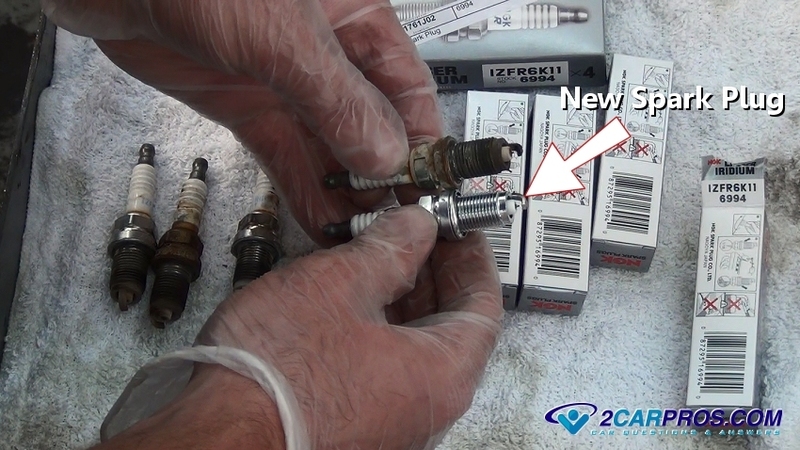 Step 10 - Compare the new spark plugs to the old units to ensure a proper installation. 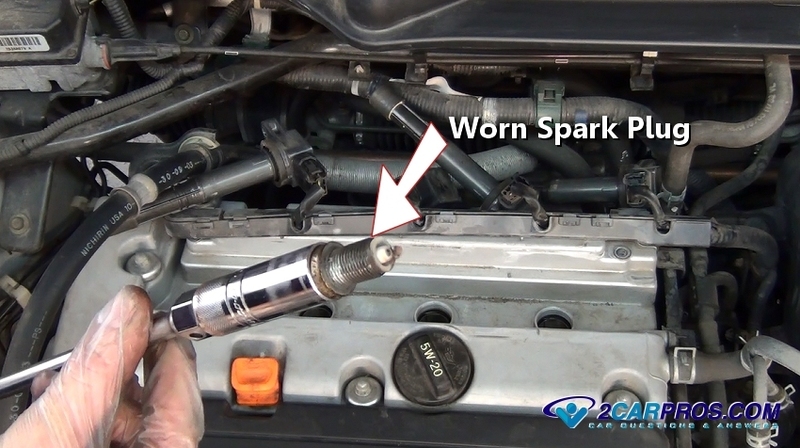 In most cases spark plugs do not need to be re-gaped as they are manufactured to the correct measurement for each application. 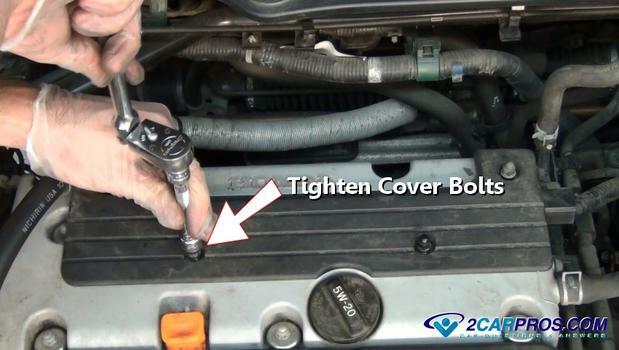 Step 11 - Before installing the new spark plugs, apply a thin layer of lubricant (anti-seize) to avoid thread galling (stripping). 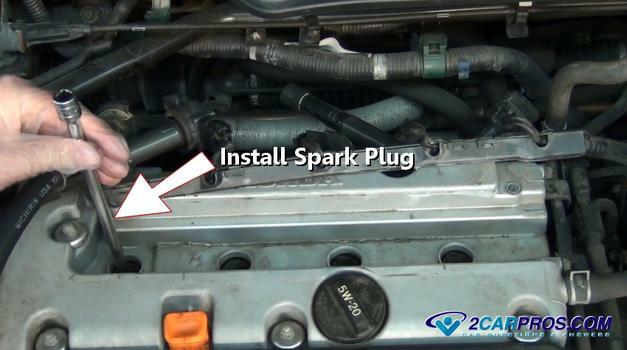 Step 12 - Insert the spark plug into the socket while ensuring a snug fit, (the spark plug shouldn't fall out of the socket on its own). Step 13 - Gently lower the spark plug down into the plug well (do not drop plug), continue installing the spark plug while threading by hand. 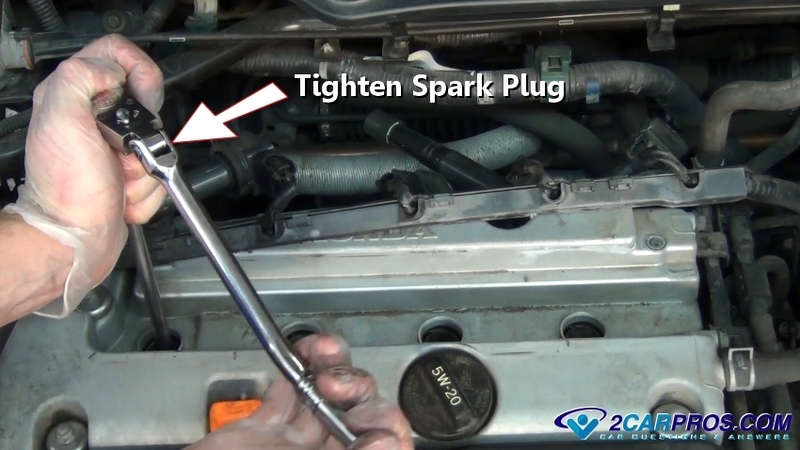 Step 14 - Once the spark plug have been installed by hand, use a ratchet to tighten to manufacturers specifications (snug, do not over tighten). 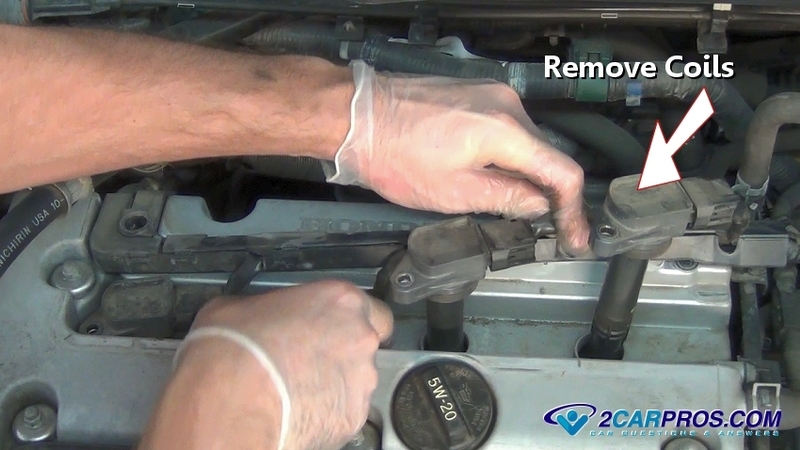 Step 15 - Next, reposition the ignition coils for re-installation. Step 16 - After installing the ignition coils, reinsert the mounting bolts and tighten. Step 17 - Once all coil mounting bolts are tight, reinstall the ignition cover back into place. Step 18 - Install all mounting bolts and tighten, double check all steps to ensure a correct completion. 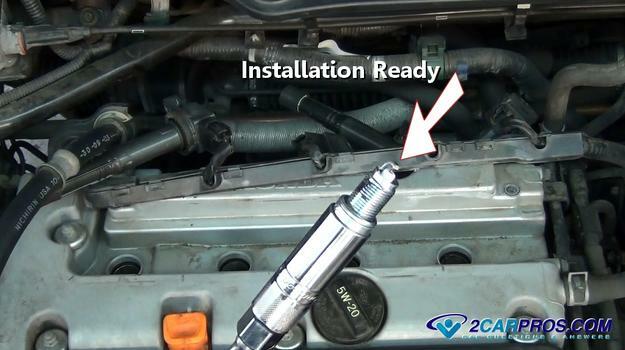 Step 19 - When replacing spark plugs always check the plug condition, this inspection can detect problems inside the engine such as rich mixture, low compression or failed injector. 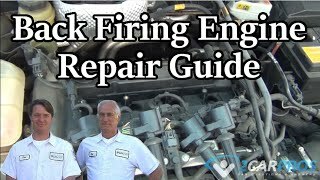 Step 20 - When a spark plug is wet with oil there is a problem with the piston rings or valve stem seals, additional problems include plugged oil drain back holes in the cylinder head. Step 21 - Before installing a new spark plug inspect the air gap in case the plug was damaged during shipping. 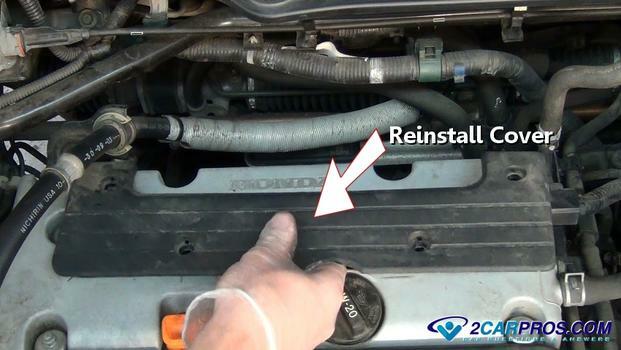 Step 22 - Visually inspect the air gap and adjust to manufacturers specifications. 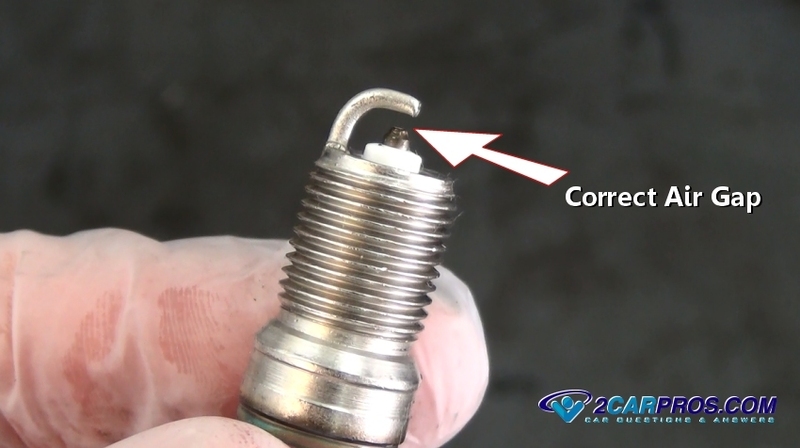 Step 23 - A spark plug is constructed of a metal housing and a porcelain insulator which is very brittle and if broken or cracked will misfire so use care when handling. 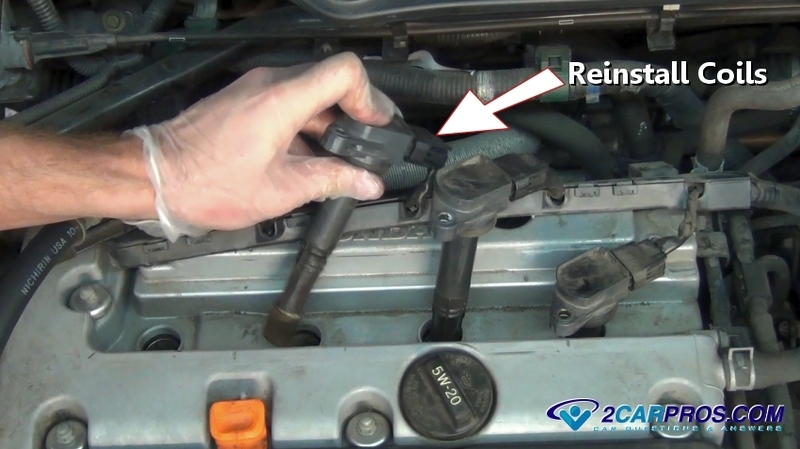 After replacing spark plugs the engine could stall, idle high or low, this is normal as the computer is re-learning the resistance of the ignition system which effects ignition timing. 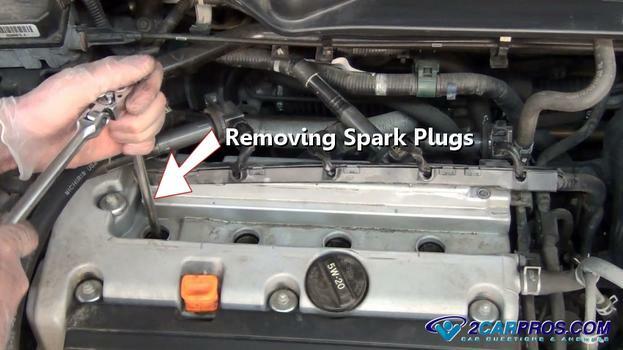 Some engine's are designed using spark plug wires which are easily removed (twist the boot to loosen seal) before removing wires. If the engine is running rich all of the spark plugs will have a black or grey soot covering the spark plug electrode and if lean all of the spark plugs will be clean and white. 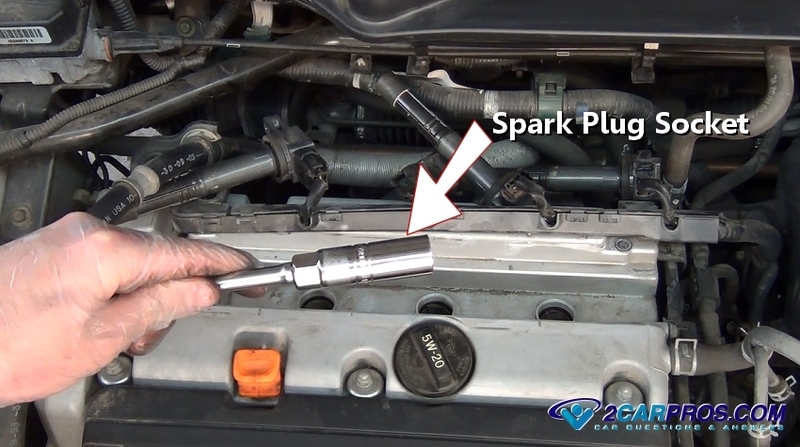 If one spark plug electrode appears different than the remaining spark plugs, that cylinder is having a problem. 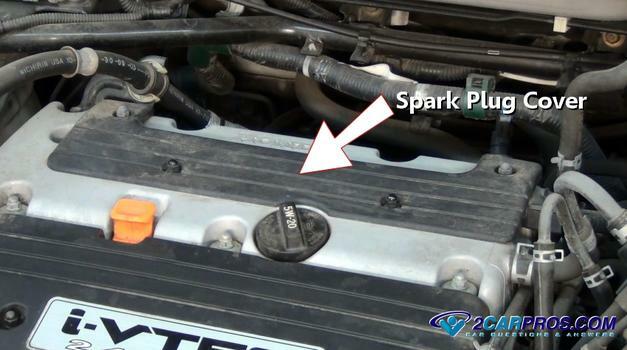 The inside of a spark plug socket is lined with a rubber cushion to safety support the spark plug insulator. 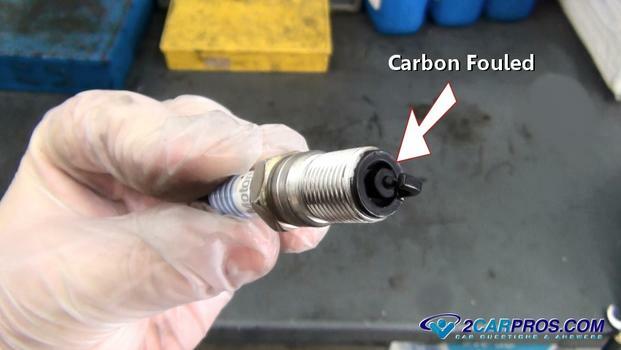 Most engine's are designed with a COS system (coil over spark plug) which has no plug wires just ignition coils, other systems include HEI (high energy ignition) which utilizes a distributor and spark plug wires. 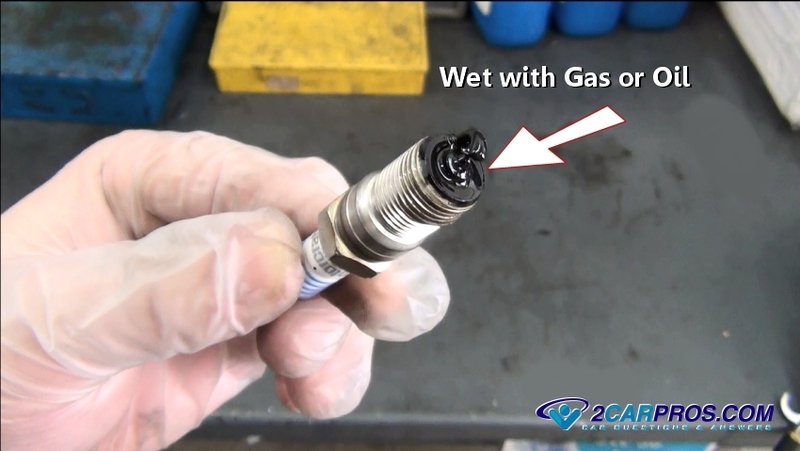 If spark plug threads are damaged use a thread cleaner or tap loaded with grease to catch the metal chips that would normally go into the combustion chamber, also use a can of compressed air with the long plastic extension inserted down into the cylinder to blow out excess particles helping the removal of additional particles. Protective gloves and eye wear. 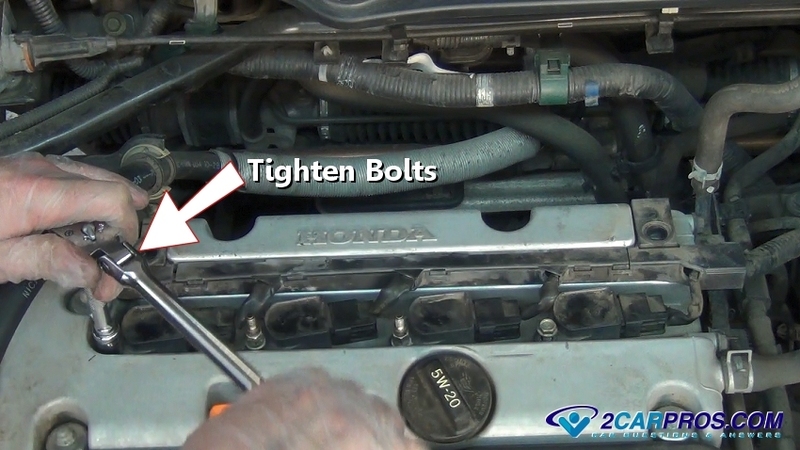 Mark plug wires with a small piece of numbered tape to identify cylinder positions. 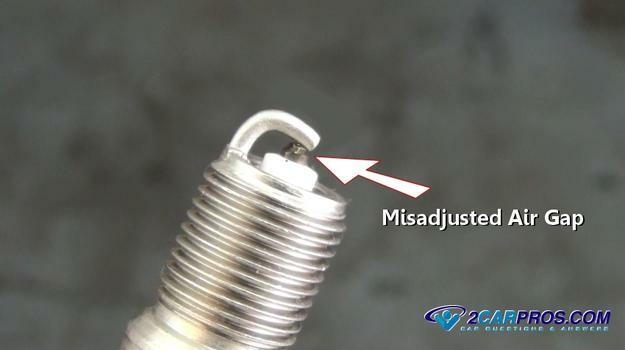 Only install the correct spark plugs, design issues can cause internal engine damage. 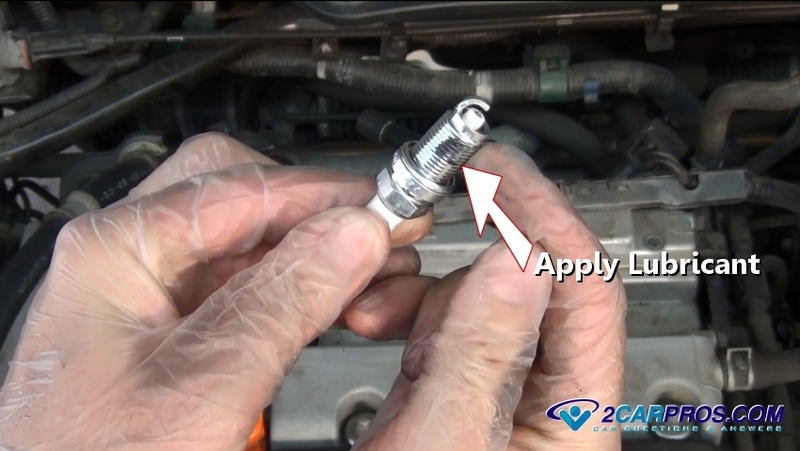 Only tighten spark plugs to "snug" and install a small portion of anti-seize grease to ensure proper installation.